Stevia syrup is a highly concentrated liquid form of stevia, a no calorie natural sweetener derived from the stevia plant. You can purchase ready-made stevia syrup or make it yourself from the leaves of the stevia herb plant. Grown in South America, stevia has been used safely and successfully for hundreds of years by Native Americans in South America. It has been widely used in Japan and other countries as a sugar substitute for over 40 years. Unlike artificial sweeteners such as aspartame, saccharine and sucralose, stevia has very few reported side effects. It has zero calories and does not raise blood glucose levels in diabetics. In fact, it may actually help diabetics better regulate their blood glucose levels. There are many stevia products on the market. Stevia in the Raw, for example, is a powdered stevia product made by the same company that creates those brown packets marked "Sugar in the Raw" that you find in restaurants. Powders and tablets are by far the most common stevia extract available, but you can also find liquid stevia and stevia syrup. Natural health food stores may stock stevia syrup in the sweetener aisle or near natural sweeteners such as agave and maple sugar. Try flavored versions or unflavored versions for their sweetening power. Remember that with stevia, less is always more; don't pile it on at first, but use just a little bit, and add more if you need it. You can find syrup made from stevia at Vita Net, which offers the syrup as well as powders and extracts. You can, indeed, make your own syrup if you have an organic, natural source of stevia leaves. The Herb Gardener blog offers directions on how to brew up your own batch of syrup. Some people confuse stevia syrup with stevia liquid extracts. Stevia syrup consists of stevia leaves boiled in water until it forms a thick, dark, syrupy liquid that looks a little like molasses. It may then be diluted with water. 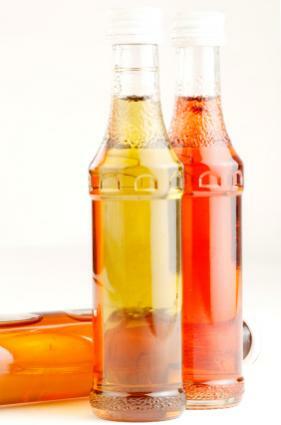 Some manufacturers of stevia syrups add natural flavor to create a syrup such as stevia vanilla-flavored syrup. Stevia extract, on the other hand, uses processing to extract the natural chemicals that give stevia's leaves their unique sweet taste. It's a concentrated form of the sweetener. Stevia syrup may be poured directly onto food or added to beverages, for example, to both flavor and sweeten. If you tried to do that with stevia extract, you'd probably gag and spit it out. In high concentrations, the chemicals that make stevia sweet also impart a bitter, licorice-like flavor that's unique to stevia. While stevia does indeed have a long record of safe use, people can be allergic to almost any substance on the planet. If you use stevia and don't feel well, break out in a rash, experience an upset stomach, or have trouble breathing, you may be having an allergic reaction to it. Seek medical attention and discontinue use.